The Plush Medium Black/Gold Pet Casket is a durable two-piece casket made of high quality plastic. The black casket lid is upholstered in a beautiful gold material. Your pet will be gently cradled on a gold satin mattress with a lace-edged coverlet and pillow. A roll of double-sided sealing tape and instructions are included. 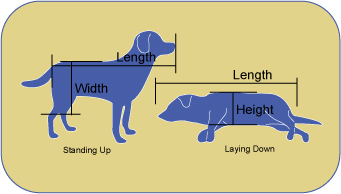 Suitable for pets measuring no more than 22 inches long from tip of nose to base of tail and weighing no more than 60 pounds. Note: The 22 lbs is dimensional shipping weight and is not the actual weight of the casket. The casket weight is 8 lbs.